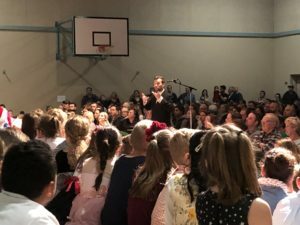 What a tremendous week we had with our annual Christmas Concert! Thank you to the many families and friends that attended our two sold-out shows! It was heart-warming to see the audience absolutely full. Our students are so fortunate to have such support and care. Putting on a whole-school concert is a tremendous endeavor. It takes a lot of helping hands to pull the show off! Special thanks to Mr. Steeves for his work teaching the students their songs and creating the production for the show. Few people know that it takes several months to prepare students for this one day event. We so appreciate the countless hours Mr. Steeves spent to make the show a success! Thank you to Mrs. Gallichen and Mrs. MacKinnon for their work each morning organizing, collecting and distributing ticket orders. It was a H UGE task and we so appreciate their volunteered time! Thank you to Mrs. Twellmann for her hours of work to create the stage and decorations, for playing the piano during the concert and for working behind the scenes to pull the loose ends together! A big thank you to all the parent helpers you offered a helping hand with concert preparations! Finally, thank you to the staff for their teamwork and support so each child could be successful at the concert. What a wonderful community we have at James Hill Elementary! 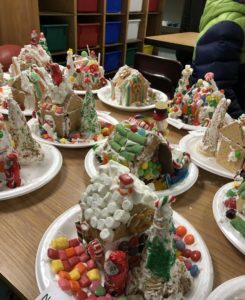 In addition to the Christmas Concert, classes are creating all sorts of Christmas goodies and traditions with their peers. 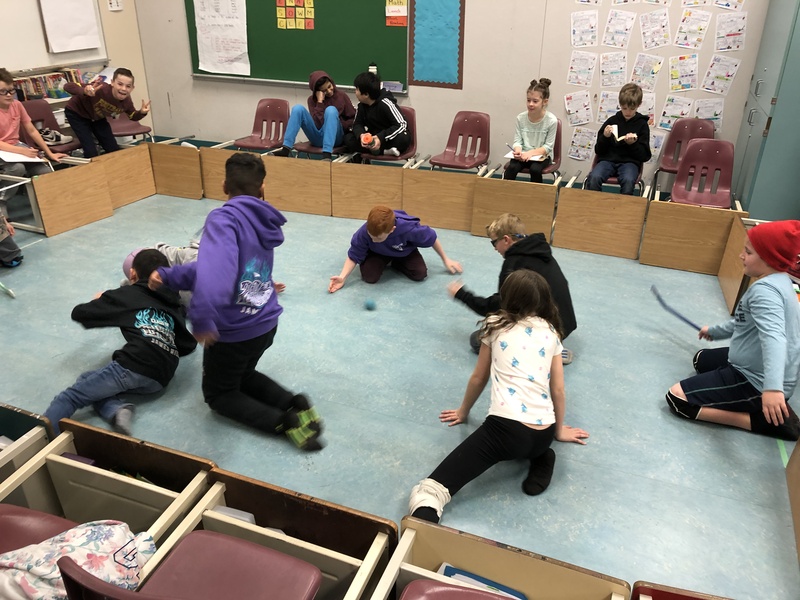 The grade four and five students continued the tradition of the Stan-Knee Cup tournament! There was a candy overload in many classrooms as students created amazing gingerbread houses. The festivities will surely continue next week as we prepare for Christmas break! On the final day of school prior to the break, we would like to start the day off with some festive cheer! Students are encouraged to participate in Holiday Sweater spirit day… wear your favourite Christmas/Winter/Holiday sweater (tacky or otherwise)! We also invite families to join us in the foyer at 8:25 am for some caroling and then to stay for Drop Everything and Read time with your children throughout the school from 9:00-9:20! It will be a great morning to send us off on the Christmas Break! Please note that grade four and five basketball practices are canceled next week. Practices will resume on Tuesday, January 8. As we mentioned in October, the District is making efforts to reduce heat consumption in all buildings following the natural gas pipeline explosion. For this reason, we are asking families to dress in layers at school so they can stay comfortable and warm throughout the day and also remove layers when they are participating in physical activity. Christmas Angel gifts are now overdue – we have approximately 8 angel gifts not returned yet so please return them as soon as possible as they are being delivered to the families this week. If you are unable to purchase a gift for the angel that you took, please email jameshillpac@gmail.com so we can make other arrangements. Thank you to everyone that has sponsored a child this year! Food Drive has now ended and we will be sorting the food on Monday morning (Dec 17th) – if you can spare a couple of hours, please come to the office and we will gladly accept your help! M&M food market fundraiser (Langley location only). When you shop at the m&m food market in Langley, if you reference James Hill Elementary at the checkout 5% of your sale gets donated to James Hill Elementary!!!! This will go on until the end of the school year. Mark Monday, February 4th on your calendar! It’s our first Parent Education night of the year focusing on Self Regulation. Stay tuned for more information to come on this. HD Stafford Middle Secondary has a few fundraisers that might also help you this festive season! Friday, December 21: Carol Singing in the foyer starting at 8:25; Christmas Sweater day; Drop Everything and Read morning until 9:20- Families welcome to join!